Grounded? Here's How Business Growth Takes Off. Marketing strategy is the north star of effective marketing action. Yet, most companies have no marketing strategy. How do we know? Because they’re doing marketing “things” like a big ‘to-do” list without really knowing why. The result is often little or no results. Your content strategy, page optimization and social media presence drive visibility and the right traffic to your website. Is your website working hard to convert your hard-won traffic into qualified sales leads? No? Grab our guide. Ever notice how Marketing and Sales teams are often at odds? Learn how to develop a Growth Team instead. It's easier to keep a customer than it is to find a new one. Discover easy ways to strengthen customer relationships. Learn everything you need to know to successfully get traffic, attract and capture qualified leads, close more deals and give customers what they long for. MARKETING MONSOON'S DATA AND RESULTS-BASED APPROACH HELPED US BUILD A STRONG BLOGGING PROGRAM. "We are delighted with the level of personal service, enthusiasm and passion Jayne and her team brings to our work together. 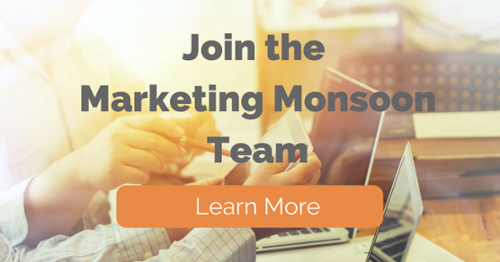 We highly recommend Marketing Monsoon to any company looking for a strong partner to grow with." Subscribe to get the latest news, events and announcements straight to your inbox.